Earlier this year, Hans Christian Jost stunned the Nova Scotia wine community by selling off his shares in Jost Vineyards and declaring he was going to get into the craft beer industry making German style brews. I haven’t had a chance to interview him yet to ask why but having recently researched several articles on the craft brewing industry in Nova Scotia, I can think of a few reasons of my own. Wineries have a five month window to make it or break it for a winning vintage. This year’s National Wine Awards were a case in point. The National Wine Awards are replacing the Canadian Wine Access Awards that died when Wine Access Magazine folded this spring. Nova Scotia wineries used to come away from the CWA covered in bling. At this years NWA, there were no golds, only a couple of silvers, and a scattering of bronze. Jost received the most medals of the lot but even their count was down. The reason could be that the 2011 growing season in Nova Scotia was not as stellar as 2010. I noticed in my own NS wine tour this spring that the taste of some of the familiar wines, were a little flat in the 2011 vintage which had been a wet year. To be a Nova Scotia wine, you can only use Nova Scotia grapes so the skill of the winemaker really comes out in the year when Nature didn’t cooperate. Brewmasters don’t have these problems. They can source their hops and malts, barley and wheat from anywhere. Garrison Brewery created a beer with 13 different kinds of hops, which you can be assured did not all come from Nova Scotia, and another brew with 13 different malts. 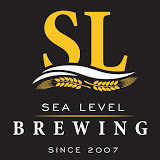 Randy Lawrence at Sea Level Brewing in Port Williams, who is the provincial hops guru, can’t keep up with the demand for his Summer Blonde ale which uses a New Zealand variety of hops called Summer. The new-eco friendly Bridge Brewing company specializes in Belgian style ale. Winemakers do most of the work in the fall with the primary and secondary fermentations of the grape harvest. After that it’s a matter of tweaking, oaking, ageing and blending to get the right taste over the next one to two years. Brewmasters have a new batch on the go every three weeks throughout the year. Even in the dead of winter they can be coming up with something new and spectacular. Randy Lawrence describes himself as just a guy in rubber boots working 10 hours a day. and when his daughter sends out a Tweet that one of his new specialty beers is ready for release, the parking lot outside the brewery fills to overflowing even in February. middle of the night when the cold cuts to the bone. In comparison, the crew at Garrison Brewery head out for a fun winter excursion on a sunny winter’s day with chainsaws to harvest spruce tips for a spruce beer they make every year. Oh and they tap the trees for the ingredients for maple ale which only a beer addict could love. Just like NS wineriess have some regulars that you will find at most wineries Seyval, Muscat, L’Acadie, Foch, Baco Noir, and Vidal Icewine; most of the larger breweries and brewpubs have IPA, wheat ale, red ale, brown ale and stout. These don’t change in taste from batch to batch the way a vintage of wine will do. Brewmasters also get to have fun with specialty brews that challenge the taste buds like Greg Nash of Hart and Thistle‘s Hop Mess Monster or Kneecapper IRA. 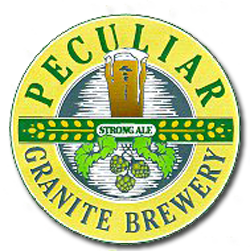 One iconic beer,,Peculiar, made by Kevin Keefe at Granite Brewery based on an old English recipe which I can best describe as ‘roast beef and Yorkshire pudding in a glass’ has been deified in the beer lover’s bible, Great Beer Guide by Michael Jackson (No, not that Michael Jackson). If it’s not selling, change it. It takes three harvests before grapes can be picked. If a wine like Marechal Foch loses ground to the new Marechal Joffre, or Leon Millot or Lucie Kuhlman, there are thousands of acres of Marechal Foch to be torn up and replanted and years before a replacement is ready. If a certain brew doesn’t find a market, it doesn’t get repeated. A brewery can change its marketing direction in a month. Both local wine and craft beer in Nova Scotia have been seeing a sharp increase in sales over the last few years. In the past twelve months, five new breweries opened in Nova Scotia in 2012-2013. 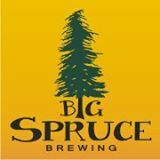 Look for them: Big Spruce only the second farmhouse organic brewery in Canada, opened in Nyanza in Cape Breton, Bridge Brewing opened in Halifax, The Townhouse in Antigonish, Uncle Leo’s in Lyon’s Brook near Pictou, Hell Bay in Cherrry Hill near Liverpool, and Boxing Rock in Shelburne. Both Garrison and Propeller have tripled their production space in the last year and Sea Level Brewing added 1000 square feet to its production facilities. Rare Bird brewpub in Guysborough expanded its brewing capabilities to be Authentic Seacoast Brewing with Rare Bird beers being sold offsite at other pubs and farmers markets. Meanwhile brewpubs like Rudders in Yarmouth, Paddy’s Pub in Wolfville and Kentville,and Rockbottom and Rogue’s Roost in Halifax are packing them in. Sometime next year, another brewing company will join the group in Tatamagouche, with Hans Christian Jost at the helm raising a stein of German styled ale. Let’s drink to the talented winemakers and brewmasters who worked so hard to give us such amazing choices of local wines and ales. With 28 Nova Scotia wines on our wine list at DesBarres Manor Inn and our own craft beer from the Authentic Seacoast Brewing Company, we’d say everyone in Nova Scotia is a winner! As someone who fell in love with the local wines of Ontario, I dreamed of one day having my own vineyard and winery. As I learned more and more about the restrictive retail environments and climatic challenges, the idea seemed more and more crazy. Your article is bang on – beer-making offers much more flexibility in terms of sourcing raw ingredients and changing to meet customer’s sometimes fickle tastes. It just lacks some of the mystery and romance of wine-making!